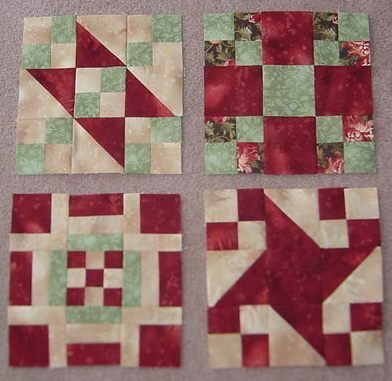 I’ve been busy and completed four more blocks! 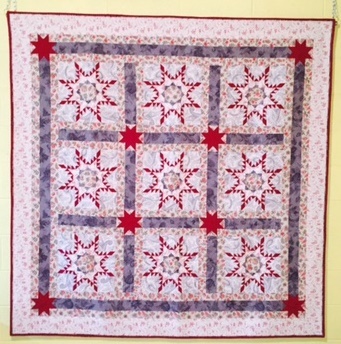 I feel very delinquint watching you get these great blocks done this week! (Pat, pat, pat; can ya feel it from way up here?? Those are so pretty! I love the color combo. Hey, Caron! pat, pat, pat! These are pretty. I intend to take Scout, our Golden Doodle, to the vet after Christmas and get her ‘fixed’ and groomed. Right now she is a fluffy mess with matted ears (I can’t tell the ears from the mats). She has a wonderful disposition, is easy going and so funny. She loves to run, run, run when she is let out but we do keep her inside. There is a pix of a Golden Doodle on the front of Mary Engelbright’s magazine, Home Companion, the holiday issue that’s out now. Scout should look like that well-groomed dog!